Chadwick George Haheo Rowan was born in Waimanalo (Hawaii) on May 8th 1969. Son of Randy, a taxi driver of Irish and Hawaiian descent, and Janice, an office worker of Cuban and Hawaiian descent, he was the eldest of two brothers and one sister. He graduated from Kaiser senior high, where he played in the basketball team. Ex-Sekiwake Takamiyama, senior among Hawaiians and the first non-Japanese to win a yusho, who then became Azumazeki oyakata. In other words, a living legend! 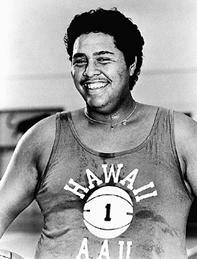 The young Hawaiian watched sumo assiduously on the television, but it was his brother George who was contacted as a potential recruit by Larry Aweau, a former judo instructor and above all a cousin of Jesse Kuhaulua (former Takamiyama and current oyakata of Azumazeki-beya). In fact, Larry Aweau thought that Chad�s center of gravity was too high due to his long legs, which is a huge drawback in sumo. But facing the parents' refusal as George was still in high-school, Aweau turned to Chad and managed to convince him to leave Hawaii Pacific University, to join Azumazeki-beya in Tokyo and the world of sumo. Young Taikai, when he entered the sumo world in March of 1988. Two months later he would be called Akebono. 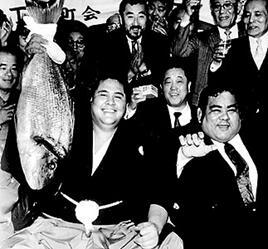 After a difficult beginning and adaptation, the new deshi was given the shikona Taikai (great ocean) for his maezumo presentation, during the Haru basho of 1988 � this promotion included the deshi Takahanada (future 65th Yokozuna Takanohana), Wakahanada (future 66th Yokozuna Wakanohana) and Koga (future Ozeki Kaio) � where he won the 3 victories opening to him the gates of Jonokuchi division, but also suffered 4 defeats. Natsu basho 88, Akebono beat Takahanada. The first encounter of two future Yokozuna Akebono and Takanohana, still in Jonokuchi. His mediocre results during this tournament affected him, but it was nothing compared to the homesickness that hit him hard. To cope with it, he took refuge in training to try and forget it, and hid his tears as much as he could, naively describing them as sweat when asked. Despite numerous phone-calls to his parents, Chad's emotional situation was so worrying that his oyakata, himself a Hawaiian, decided to confiscate his passport to prevent him from leaving on a sudden impulse. Seeing Taikai's motivation and training, Azumazeki oyakata decided to change his shikona for the Natsu basho 1988 and gave him a shikona full of hope, as it means �dawn�: Akebono. Akebono quickly soared up the ranks and reached Juryo in March of 1990, after 11 basho - 58 victories and 19 defeats -and most of all not a single make-koshi. But Takahanada and Wakahanada were always there, and though the Hawaiian held in front of them, the brothers reaped all the recognition and favours of the press. Akebono was frustrated by that and, spending only 3 basho in Juryo (30-15), arrived to Makuuchi at the rank of Maegashira 14 East for Aki basho 1990 to get ahead of his two rivals. During the year 1991 Akebono kept swinging between Maegashira and Sekiwake, to end up at the rank of Maegashira 1 West during the Kyushu basho, with a year's score of 46-44 (4 kachi-koshi and 2 make-koshi). But he felt stronger than the Hanadas and wanted to prove it on the dohyo to everybody. Akebono and the two brothers Wakahanada and Takahanada took the opportunity of the absence of Yokozuna, starting the year 1992 with an exceptional Hatsu basho : the trio shared all the prizes in that tournament, but the yusho went to Takahanada. In spite of a good 13-2 score, Akebono was furious to see his rival Takahanada, whom he beat during the tournament, take his first title before he himself did. Again it was glory for Takahanada and nothing for him. It was at this time that Akebono kept the portraits of Takahanada and Wakahanada underneath his mattress, and sternly gazed at them before going to sleep, so he would always have this situation in mind, though he was convinced he was the stronger one. During these evening s�ances Akebono developed his killer look, which scared every rikishi who had had the bad luck to face him. For Haru basho, Akebono was promoted to the rank of Sekiwake East. It was after winning his first yusho in the Natsu basho that Akebono was promoted to Ozeki rank, joining oversized Konishiki and charismatic Kirishima. The new Ozeki was absent from his first tournament with a foot injury. He won his 2nd yusho in Kyushu basho 1992, and thus had an oppotunity to become the first non-Japanese Yokozuna, should he win Hatsu basho 1993. This possible promotion overshadowed the demotion of Kirishima to Sekiwake. In fact, the first tournament of the new year had an unprecedented banzuke, not because of the absence of Yokozuna, but rather because there was no Japanese at the rank of Ozeki, and because a foreign wrestler had a chance to reach the highest rank. When the final bout of the tournament came, all of Akebono's motivation was shown at the tachiai which put Takahanada in trouble and allowed the Hawaiian to expel his opponent with an oshidashi. 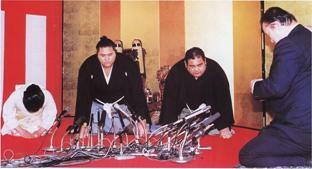 Akebono thus became the 64th Yokozuna, and more significantly the first of foreign origins. He chose the Unryu style, and did his introductory Yokozuna dohyo-iri on January 31st 1993, in front of 62 % of Japanese households who watched this new snow-crowned Yokozuna on their television sets. Akebono lost his father on July 21st 1993, and ended the year 1993 with a Yokozuna promotion, 4 yusho and a score of 76-14. 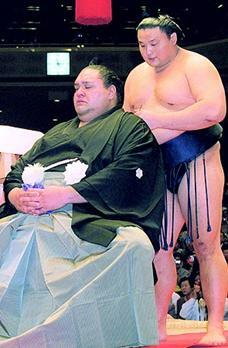 In 1994, Akebono only won the Haru basho, having his hands full with Ozeki such as Takanohana, Wakanohana and Musashimaru, all future Yokozuna who divided the yusho among themselves. The year 1995 started with the first basho of new Yokozuna Takanohana, and moreover his first yusho at that rank. Stung to the quick, Akebono won the following basho. For the two summer tournaments, Akebono was again overshadowed by the pride of Japan who got his hands on Nagoya yusho and then won Aki basho with a zensho-yusho. After a tour in France, the last tournament of the year went to Wakanohana, and Akebono withdrew on the 10th day on injury, with a 7-3-5 score. Akebono wanted to come back quickly, but he had to withdraw from the Hatsu basho on the 3rd day and did not appear at all during the Haru basho. In April, Akebono obtained the Japanese nationality. He completed the Natsu basho with a respectable score of 10-5 and continued his recovery by finishing the Nagoya basho with 12 victories. The last two tournaments allowed him to finish the year with a total score of 43-20-27. The year 1997 started with Wakanohana's yusho, then it was Takanohana's turn and finally the Natsu basho went to Akebono. This yusho would be his last in the century. For the Aki basho, the Hawaiian had his worst score (9-6), and was absent for the final tournament of the year. In 1998, he represented Japan during the Winter Olympic Games in Nagano where he performed a Yokozuna dohyo-iri for the opening ceremony, married Marie Christine Reiko, and was absent from the last tournament of the year because his weight had started to wear on his knees. One had to wait until May 1999 to see the return of this giant who remained an eternal runner-up in yusho race, and who was absent again for the Kyushu basho. The year 2000 started with the yusho of a Sekiwake, Musoyama, of a Maegashira 14, Takatoriki and of Komusubi-ranked Kaio. 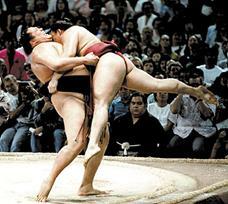 In Nagoya, Akebono showed his mettle and won his 10th yusho, while Musashimaru ended up victorious in the Aki basho. Then it was the final tournament of the year 2000, and the tension peacked since each of the two Hawaiians wished to win their second tournament of the year, and Takanohana wanted to end his series of 12 basho without a yusho. 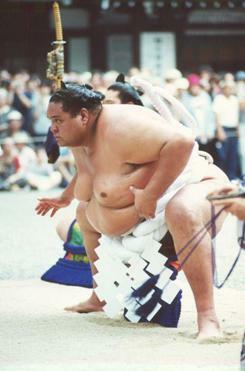 Akebono left no chance for other Yokozuna and won the 11th and final yusho of his career. In 2001, Akebono announced that he would not participate in the Hatsu basho and that this would be his last appearance on the banzuke. The Hawaiian retired after 13 years of career, with 654 victories and 232 defeats, 48 tournaments ranked as Yokozuna, and 11 yusho. Very rare tsuri-dashi performed by Akebono. Akebono's danpatsu shiki took place in Kokugikan on September 29th and the Nihon Sumo Kyokai awarded him a sum of 100 million yen as acknowledgment of his career and his exceptional contribution to this sport. He became an oyakata of the Azumazeki-beya, but to general amazement he quit after over 2 years, on November 6th 2003, to join K1. Takanohana cutting the hair of his great rival. Akebono has left his mark on the world of sumo and proven that a foreigner could be an extraordinary Yokozuna, as much by results in the sport as by the dignity required by that rank. He has opened the doors to future gaijin who wish to become exceptional wrestlers, showing them an example of sacrifice spirit, work and sincerity. In hope that his new sport career will not smudge the immortal image this man left us, I wish to us all that one day we may witness a worthy successor of Akebono on the dohyo, in spite of the complete absence of wrestlers of Hawaiian origin since Musashimaru's retirement during Kyushu basho 2003.